2. What are the 7 Benefits of working with EA? Enterprise Architecture is needed to implement transformation because of the strategy. EA helps your technology innovation. Enterprise Architecture (EA) means two things. It is both a process (1) and a product (2). Enterprise Architecture as a field of work is the art and science of designing and realizing enterprises. Enterprise Architecture as in the architecture of an enterprise is the total concept of that enterprise, consisting of concepts that provide construction, operation and decoration to that enterprise. Every organization has a coherent set of concepts applied to it, like process orientation, service orientation, b2b marketing and automation. Therefore every organization has an enterprise architecture. If you look at only the business concepts of the enterprise one can speak of the Business Architecture. When one only looks at the IT concepts of the enterprise one can speak of the IT architecture as part of the Enterprise Architecture. In this way, one can recognize many different types of architecture in an enterprise. Architects use the strategy, needs and requirements of stakeholders and their own experience to select the right and required concepts (with principles / working mechanisms) and standards for the organization. Next they get the concepts, principles and standards approved by CxOs and provide projects with visualizations to guide them in implementing the concepts, principles and standards. A misconception of architecture is that EA can be a description only. That is not true. EA is a total concept. That total concept can be designed, visualized and described. If you do not describe the architecture of a pyramid or an enterprise, these two structures still have an architecture and that architecture will enable or block certain changes and innovation. Therefore architecture cannot be just a description. A conceptual blueprint as a product or document can be part of the design, visualization or description of an architecture, but a blueprint is not the architecture itself. Architecture is a total concept applied to a structure. Nothing more and nothing less. And creating a conceptual blueprint as document or visualization to control architecture, is a best practice. The point is, that if you only describe enterprise architecture, you are not working with enterprise architecture or gaining its benefits, as in guiding a project to make use of principles and standards that eventually will implement the strategy. In order to actually work with enterprise architecture you need to start up a process, assign roles to people, have people educated and have people create products, approve products and use products. Enterprise architecture has many well-known benefits like providing insights and overview of structures and dependencies between processes and applications. But in the view of strategy it pays off to formulate proven EA benefits that directly can be justified financially and strategically. All these benefits justify investing money into the enterprise architecture initiative in an organization. The most well-known benefit of EA is to create common insights and overviews about relationships and interdependencies. This leads to reducing miscommunication and misunderstandings. The second most well-known benefit of EA is about visualizing and using knowledge on the impact of change. With this, you can prevent showstoppers in projects better. Working with Enterprise Architecture leads to increasing the ability to change and transform. You may want to implement new technologies and concepts like artificial intelligence, block and IoT in order to innovate your business model. Having EA documented and used in projects, makes sure that you know exactly how everything is currently configured, related and works in your organization and what the impact of change on anything is in the near future. Dragon1 as EA method supports you in creating the necessary holistic view on the enterprise. You may want to collaborate seamlessly with other organizations or have your business unit collaborate more efficiently together. For instance with one consistent client view. If you would only have solutions built on open standards, then integrating processes, services and applications are easy to do. EA is a proven tool or method to standardize IT successfully. The less diverse an IT landscape is, and the fewer relationships or interfaces there, the less complex the IT landscape is. Lower complexity leads to higher availability, an improved way of working of the IT landscape and much fewer risks it will fail. Dragon1 as open EA method supports you in standardizing your IT Landscape. Read more about Technology Standardization using Dragon1 for EA. In organizations many things happen where not everyone is constantly busy with thinking: how necessary is this what we do in relation to the strategy? When working with EA, every project that is not related to or necessary because of strategy, get the advice to be stopped. Also every process, service, systems or construction that is not adding value to the business model or strategy, is advised to be stopped. This reduces complexity significantly and with that increases stability and overall quality. Rationalizing every solution, based on benchmarks, standards, experience and reference will reduce costs. Read more about IT Cost reduction using Dragon1 for EA. Working with Enterprise Architecture has a history of improving processes. The fundamental lean redesign of chains of activities, complex services and products requires global and detailed insights and overviews. Architecture visualization can quickly provide information on the impact of change a redesign of a process, service or product has. When processes are improved, fewer mistakes are made, resources are used more efficient and effective and customers and clients immediately will experience the improvement. Read more about Business Process Improvement using Dragon1 for EA. Every organization that has a strategy will want to realize it. ANd for that put up programs and projects. Enterprise Architecture is most helpful for reviewing, feedback and using the strategy: the strategic priorities and initiatives can be connected to programs and projects that realize them. Architecture can provide the integral blueprints and landscapes for the strategically required concepts, principles, standards and solutions and guide projects with them. Read more about Strategy Realization using Dragon1 for EA. Today the customer wants an organization to be smart, so they can get the best experience possible. They want an organization to make maximum use of what it knows about products, processes, technologies and customer behavior. Customer Journey Mapping is a new way of creating insights in what a customer wants and how it is provided to the customer. In order to be able to deliver what i promised or is neccessary, many projects have to collaborate in a efficient way and perform a continuous transformation of the organization. What these projects need are global and detailed insights and overviews, principles and standards that guide their project execution. That is why every organziation that wants to become smart will benefit from working with Enterprise Architecture. In order to realize 1 or 2 benefits out of 5 of working with Enterprise Architecture, is it necessary to scale up to maturity level #1. Dragon1 defines Maturity Level #1 of working with EA as follows: The architecture team provides services to every project, every project potentially can make use of architecture products that are available to them. The most important stakeholders are aware of what EA is and the benefits and its products, the EA process is rudimentary in place. The architects can make use of the Enterprise Architecture Dossier (as common ground and unique base) to answer any simple question by a stakeholder. Not all views thinkable are present, but the most common ones are. At the bottom of this page a configuration is provided for an Enterprise Architecture Dossier at maturity level #1. Next to the overall benefits, EA has also role specific benefits. Some of them are outlined below. Per type of stakeholder, products are mentioned that the stakeholders can use in their work. Working with enterprise architecture improves processes that clients and customers depend upon and rely upon. Working with enterprise architecture improves the data quality of the organization, it enables permanent education for employees and increases career options for employees, because the organization is better able to execute its strategy. A business manager will have constant insights and overview of the processes he or she is responsible for. If a business manager wants to innovate the part of the business he or she is responsible for, very quickly architects and the architecture can provide feedback on what the impact or resistance in the organization is and provide projects with designs and guidelines on how to realize that innovation. IT Managers can be more ambitious if they work with EA. For instance: reducing 30% costs instead of 20% on application licenses and maintenance. HR Manager can source the organization better with skills and competencies that are required. A financial manager can make sure that investments in innovation are more aligned with the strategy and that the usage of resources is more in line to the business case. Financial Landscape Map, with a view on justified costs of assets and projects in line with the strategy. Directors benefits from EA because it helps them to communicate the strategy to everyone and have an integral designs for every project to realize the strategy step by step. It makes sense to organize and control working with enterprise architecture in any organization. And this can be done at a various level of maturity. 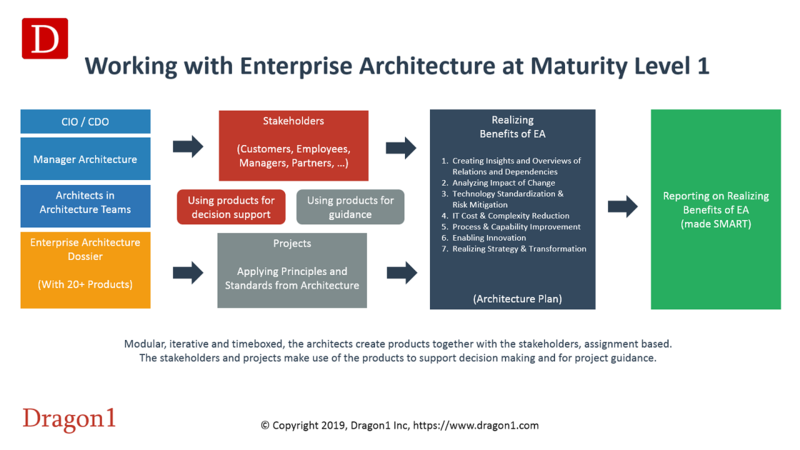 Compliant to Dragon1, at the first level of maturity, the organization recognizes there is an architecture (more architectures) present in the organization and that it pays of making it tangible and using it to guide change and innovation. Several people are assigned with the role of manager architecture (exactly 1) and architect (at least 1, preferably 3) and a first process of working with architecture is put in place that tells how to create and make use of enterprise architecture products and a basic enterprise architecture dossier is created and maintained containing the enterprise architecture products. Commonly the CIO is the owner of the Enterprise Architecture. One can create many products in an organization for many stakeholders when starting up working with EA. Dragon1 promotes the following basic products to create as part of maturity level 1. The products are placed in the order they are commonly created. EA Assignment or EA Statement - This is a document where a director states the mission, vision, ambition and goals for working with enterprise architecture in the organization and declares him or herself the owner of the architecture. Often the architecture manager and architects that are responsible and accountable for EA are named. In the document it is described when working with EA in the organization can be seen as a success and how that can be measured. On a yearly basis, this document should be updated. EA Process - The process description of working with enterprise architecture in the organization: how are various roles in the organization going to ask, create and use EA products. EA Framework - Document with description and visualization of the recognized architecture in the organization: responsibility, accountability, which architectures are and in scope and out of scope for which years, the main parts of architecture to manage and administer. EA Product Roadmap and EA Product Calendar - A document when the documents, products and visualizations in this list are produced and delivered. Architecture Team Services Menu - A document, like an intranet page, that describes the services the architecture team provides to the stakeholders. Meetings Schedule - When is everyone going to meet to discuss the creation of products, provide input, provide feedback and use them. Application Landscape - Document with description and views of various aspects of all the applications in the organization: f.i. dependencies, relationships, technologies, concepts, principles, methods, standards, life cycles, responsibilities. Process Landscape - Document with description and views of various aspects of all the process in the organization: f.i. dependencies, relationships, technologies, concepts, principles, methods, standards, life cycles, responsibilities. Enterprise Functions Overview (Structure Vision) - A document with a description and visualization of the main enterprise, business and IT functions and domains that currently are applied onto the organization. Architecture Concepts Overview (Architecture Vision) - A document with a description and visualization of the main concepts that currently are applied onto the organization. Architecture Principles Overview - A document with the description and visualization of the principles of the concepts that currently are applied to the organization. Standards Overview - A document with the description and visualization of the standards per domain per architecture layer that currently are applied to the organization. And the level of compliance with these standards. Make sure that you create a calendar where you plan when what product is created and delivered. Make sure that for every product there is someone who asked for it or ordered it and someone is the owner and administrator or editor of it (for controlled maintenance). At first you will mainly create visualizations as part of the products that are management overviews. Over time you will see that you create visualizations that are for different stakeholders. This is what we call views. Know that you may need a view per type of stakeholder in order to have a product used by that type of stakeholder. In architecture we distinguish between current (AS-IS) and future (TO-BE) state of the architecture. Visualizations of the views of the AS-IS architecture will show the principles and standards per domain per architecture layer that are currently in place or effective. Visualizations of the views of the TO-BE architecture will show the principles and standards per domain per architecture layer that are in the future implemented or effective. With the visualizations of two different moments of architecture one can create a roadmap in order to migrate the whole or part of the organization from working with the current set of principles and standards to the new future set of principles and standards. Dragon1 is an open EA method, so you can start using Dragon1 right away. If you have any question about working with Enterprise Architecture, or want support from a Dragon1 Expert, please contact us at info@dragon1.com.